Now we find that the plant has been a net emitter of carbon dioxide, falsely described as a carbon polluter by Fox News. Even as the Obama administration announces another $120 million in grants to boost solar energy, new reports indicate a centerpiece of the administration's green-energy effort is actually a carbon polluter. Located in Southern California's Mojave Desert, the $2.2 billion Ivanpah Solar Electric Generating System benefited from a $1.6 billion Energy Department loan guarantee, and a $539 million Treasury Department stimulus grant to help pay off the loan. Yet it is producing carbon emissions at nearly twice the amount that compels power plants and companies to participate in the state's cap-and-trade program. That's because the plant relies on natural gas as a supplementary fuel. Why does a solar plant need to burn Natural Gas? WHY vaporise birds, threaten tortoises, coyotes, kit foxes and bobcats for a plant that produces no-so-green energy? Seriously folks, Ivanpah's CO2 emissions are 1/15 those of a coal fired power station (75 compared to 1137 lbs/MWhr https://theconversation.com/if-a-solar-plant-uses-natural-gas-is-it-still-green-50046 ) even considering that the Ivanpah CO2 includes that emitted by cleaning machines and etc whereas the emissions for the coal stations do not. Thus Ivanpah reduces emissions by 400,000 tonnes of CO2/year compared to similar output by a coal-fired plant. 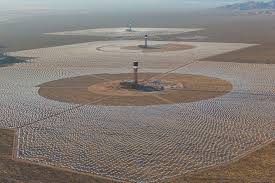 Ivanpah uses 0.03 gals water/kWhr, less than 1/16 that used by a coal-fired plant http://www.brightsourceenergy.com/stuff/contentmgr/files/0/8a69e55a233e0b7edfe14b9f77f5eb8d/folder/ivanpah_fact_sheet_3_26_14.pdf. Overall, solar power in all its forms has about 1/8 the CO2 emissions of a coal-fired plant over its life cycle. At the end the solar plant can be removed and previous activities re-commenced. Tried that after mountain-top removal or open-cut coal mining?